Consolidating disparate ranges into one print area: Sometimes a data model gets so complex that it’s difficult to keep all the final data in one printable area. This often forces you to print multiple pages inconsistent in layout and size. 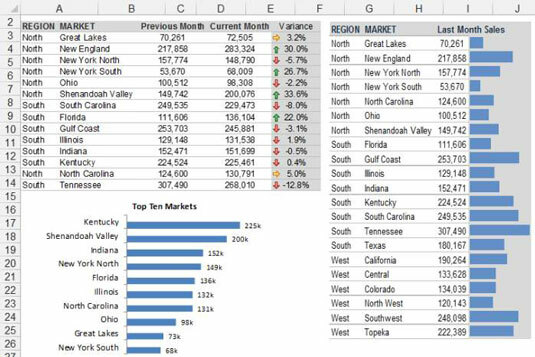 Given that dashboards are most effective when contained in a compact area that can be printed in a page or two, complex data models prove to be problematic when it comes to layout and design. You can use the Camera tool in these situations to create live pictures of various ranges that you can place on a single page. This figure shows a workbook that contains data from various worksheets. The secret here is that these are nothing more than linked pictures created by the Camera tool. As you can see, you can create and manage multiple analyses on different tabs and then bring together all your presentation pieces into a nicely formatted presentation layer. Rotating objects to save time: Again, because the Camera tool outputs pictures, you can rotate the pictures in situations in which placing the copied range on its side can help save time. A great example is a chart. Certain charts are relatively easy to create in a vertical orientation but extremely difficult to create in a horizontal orientation. The Camera tool to the rescue! When the live picture of the chart is created, all you have to do is change the alignment of the chart labels and then rotate the picture using the rotate handle to create a horizontal version. Creating small charts: When you create pictures with the Camera Tool, you can resize and move the pictures around freely. This gives you the freedom to test different layouts and chart sizes without the need to work around column widths, hidden rows, or other such nonsense.